A beautiful photo, capturing a launch that sparked 65 years of space innovation. 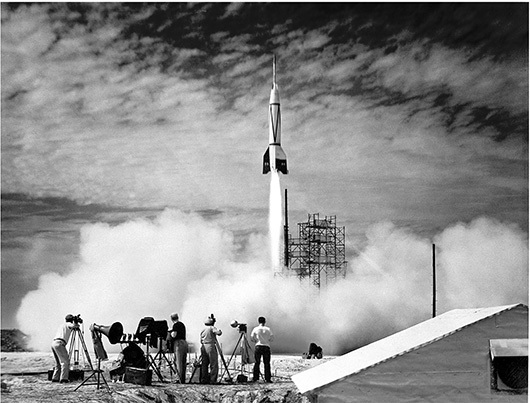 A new chapter in space flight began in July 1950 with the launch of the first rocket from Cape Canaveral , Florida: the Bumper 8. Shown above, Bumper 8 was an ambitious two-stage rocket program that topped a V-2 missile base with a WAC Corporal rocket. The upper stage was able to reach then-record altitudes of almost 400 kilometers, higher than even modern Space Shuttles fly today. Launched under the direction of the General Electric Company, the Bumper Project was used primarily for testing rocket systems and for research on the upper atmosphere . Bumper rockets carried small payloads that allowed them to measure attributes including air temperature and cosmic ray impacts. Seven years later, the Soviet Union launched Sputnik I and Sputnik II, the first satellites into Earth orbit. In response, in 1958, the US created NASA and launched Explorer 1. This Free Art Download is available in a giant 16″ x 20″ format. It'll look great printed full-size, or shrunk down to smaller sizes like our standard 11″ x 14″. If you make one, I'd love to see a picture of it! As always, this Free Art Download includes a built-in white matte border to give your framed piece that finished, polished look. I have become a Costco Photo Center fanboy: Get an amazing quality 16″ x 20″ poster print for only $6.53 tax included. Upload it online, and pick it up later that day. Even if you don't have a Costco membership, if you plan on printing a few of these out it would probably be worth signing up for one. A similar print from Staples is $19.99! If you're going for a smaller print like an 11″ x 14″, the standard black and white print from Staples will work great. Simply have it printed on 11″ x 17″ paper and trim it to fit your frame. Should be less than $2. The frame above is the “Verserum” from IKEA, which only costs $12.99. You can have this beautiful piece of history printed and framed for less than $20! Awesome! To get the same look as above, give the frame a pass with gray spray paint, and once dried, rub it with some sand paper to get the weathered look. What sort of grit sandpaper would you recommend? I think I used 150. If you use something too course it’ll take big chunks off.